Based in Ossett, Anne-Marie Barnes is the Instructor at Relaxed Baby celebrating over ten years delivering courses for families with new babies. She delivers small courses from her home in an informal friendly setting for parents. She is a qualified Baby Massage IAIM instructor, Birthlight trained for Baby Yoga, Baby Signing. The Children's reflexology Instructor too and is fully insured and CRB checked. She has been teaching parents in small relaxed groups from her home since 2008. It is lovely seeing new additions to families as they come back to experience Baby Massage, Baby Yoga and Baby Signing with their new arrivals. Baby Massage is when a parent lovingly strokes or holds their baby. Massage offers a wonderful opportunity to experience a special time to communicate with babies so they feel loved, valued and respected. Taking time out together for a massage teaches baby how to relax, and you will relax too. Massage helps to strengthen parent and baby interaction. Baby massage has physical benefits such as helps give relief from colic, wind and constipation and for babies can play a vital role in circulation, digestion, establishing sleep patterns and growth. suitable for babies from 3 weeks onwards. Baby Yoga allows babies the freedom to stretch, relax and have fun. Baby Yoga offers stimulation helping babies achieve development goals of rolling, sitting and crawling. Yoga encourages co-ordination and flexibility. It helps parents to gain confidence in handling their baby. Yoga also promotes sleep and relaxation in your little ones and is an enjoyable way of strenghtening the bond between baby and parent, It can help with colic and constipation, slow weight gain, sleep patterns, feeding difficulties, bonding and much more. Yoga is suitable for babies from 8 weeks onwards. 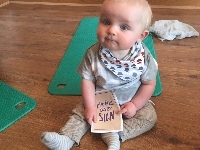 Baby signing bridges the communication gap - aiding babies to show their parents what they want/need before they can talk! Relaxed Baby teaches basic BSL (British Sign Language), as it's a widely used & recognised language, combining the benefits of music (action songs, rhymes & musical instruments) and signs. We teach you and your baby basic signs such as "milk", "eat" , "all gone" and much more, covering a variety of everyday topics. The Children's Reflexology programme is a simple course of fun and interactive sessions. It empowers parents and carers to be able to offer their children a non- invasive complementary therapy at home. The course shows you how to treat specific conditions of childhood and includes a series of handouts in the form of mini booklets that can be used by parents at home. Courses are suitable for Newborns onwards to older children.